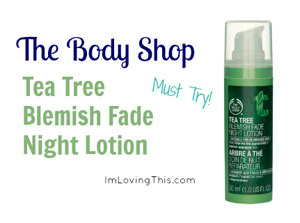 I’ve been using The Body Shop’s Tea Tree Blemish Fade Night Lotion for years. I used to only use it when my skin was rebelling. Recently I purchased another bottle of it when they were having a 40% off sale and have been using it on a regular basis. It’s become one of my holy grail products. 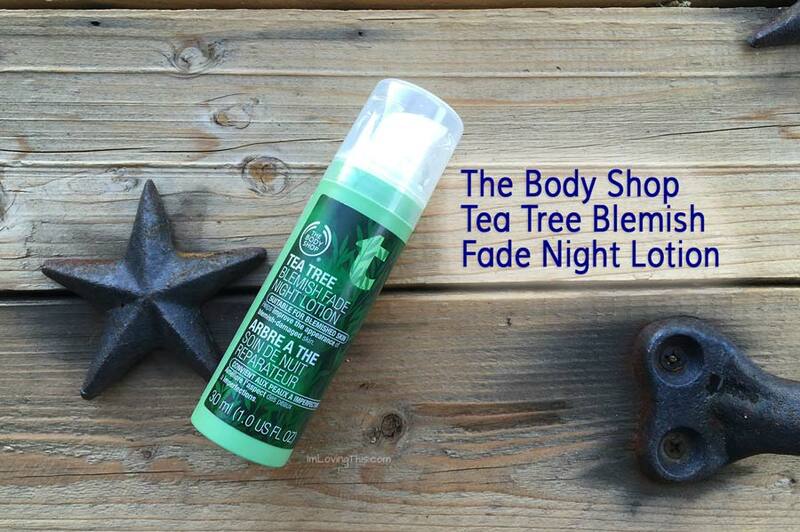 The Body Shop’s Tea Tree Blemish Fade Night Lotion says it is suitable for blemish skin and helps improve the appearance of blemish-damaged skin. This product comes in a 30 ml bottle with a pump, the packaging works well to help dispense just the right amount of product. The bottle retails for $19 on the Body Shop’s website but they have sales often so you can get it for less. You can also use Ebates to get a percentage of your order back in cash. First off, let me start out by saying that I absolutely love the smell of this lotion! I am a huge fan of tea tree oil, so that is why I enjoy the smell. If you don’t enjoy the herbal, tea tree smell then this product is not for you. But if you can get past that then you should definitely try it out. The lotion directions say to apply it on your face and neck before bed. I use it before bed and sometimes in the morning as well. It really helps soothe my skin when I’m having breakouts so if I’m really irritated then that’s when I’ll apply it in the morning. The lotion is very light-weight, which is great for people with oily or combination skin like myself. Sometimes I will put my regular night-time moisturizer over top if I want extra hydration. This product doesn’t claim to help battle breakouts, what it says is that it helps improve the appearance of blemish-damaged skin. However, I find that it does help battle my breakouts and I have stopped using my salicylic acid and benzoyl peroxide spot treatments. Instead I have been using the blemish fade lotion along with the Body Shop’s Tea Tree Oil and regular tea tree oil. I’ve been applying this lotion over red marks left from previous blemishes for over a month straight now. I’ve noticed that all the marks are slowly fading over time and I’m super excited about this! I’ve had three stubborn marks on my cheek since a bad breakout around Christmas that have been really bothering me and the marks are almost gone now. I wish I had used the Body Shop’s Tea Tree Blemish Fade Night Lotion on them sooner. So if you can’t already tell, I love this product! If you have scaring from breakouts or have breakout prone skin then you should definitely give this lotion a try. I’m going to try the other products in the line when they have another sale so stay tuned for more reviews. What are your favourite Body Shop products? I’d love to hear your suggestions!